Reproducing bass tones without distortion has always been problematic for designers of loudspeaker enclosures. Large amounts of electrical power have to be translated into air-pressure variations, and in doing so, the speaker cone can easily get out of control, partly due to the effects of the enclosure. 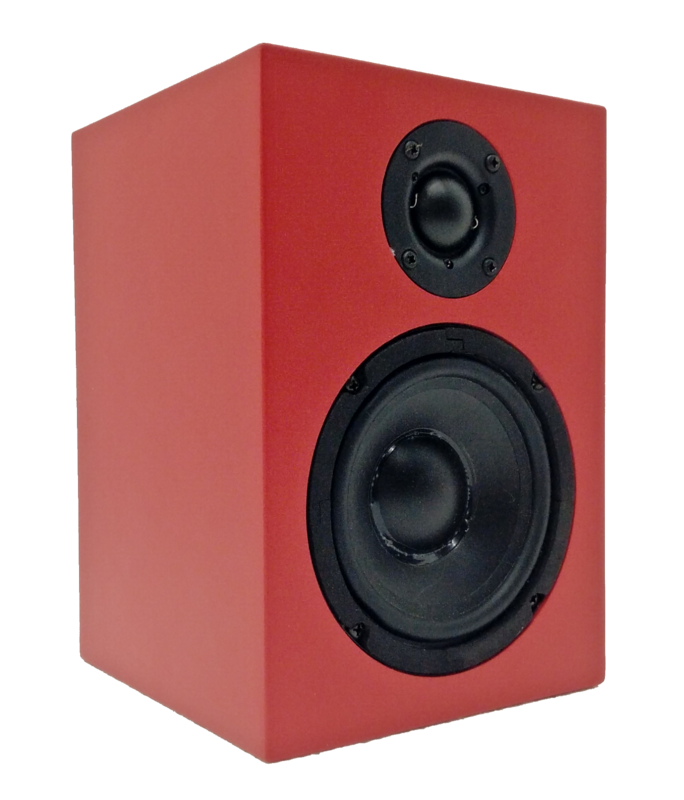 Designers have tried to solve the problem by putting very large loudspeakers into very bulky cabinets, and by using vented ports or transmission lines, but these produce their own problems. The real answer is to stop the enclosure from influencing the movement of the bass loudspeaker cone and this is precisely what motional feedback does. An accelerometer mounted on the woofer voicecoil produces a voltage in proportion to the cone's vibration. This is fed back and compared to the voltage that made the cone vibrate in the first place. If there's any difference, corrective action is instantly taken, so that the cone is incapable of distorting the sound. True bass response is assured, even from small enclosures. 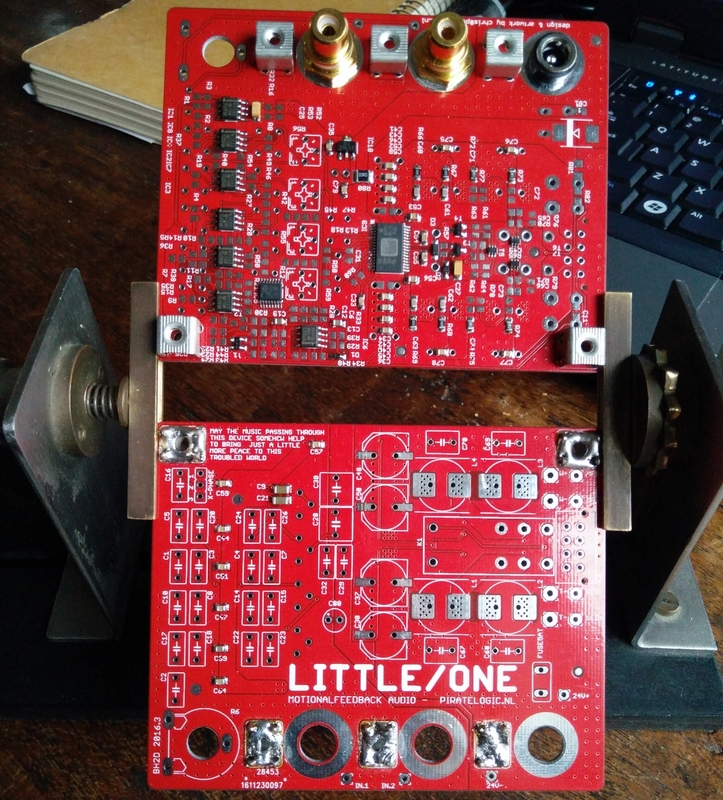 The Little/One shows off what MFB does best : combine modest dimensions with a very mature sound. 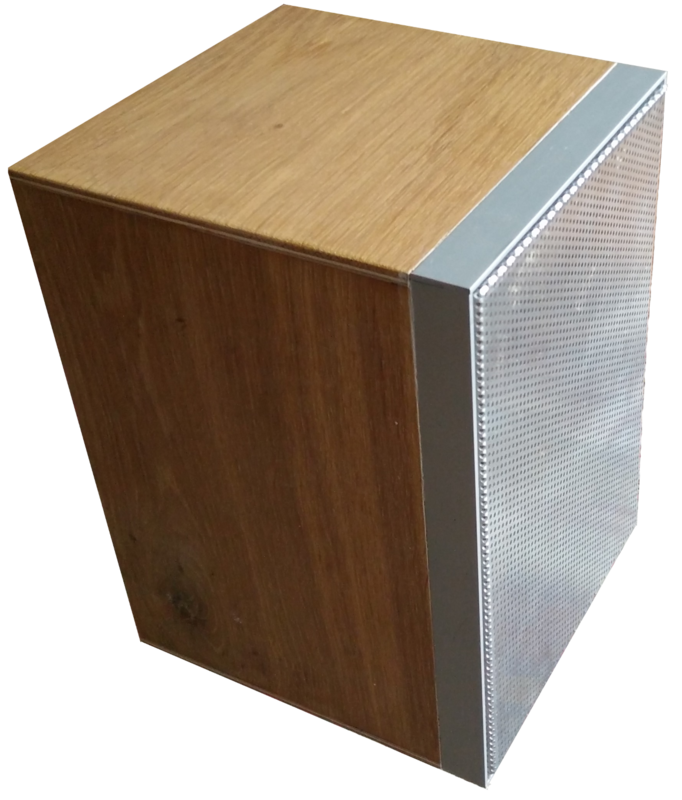 With 17x17x24 cm the smallest MFB enclosure to date, newly developed in Amsterdam using modern drivers with state of the art electronics. 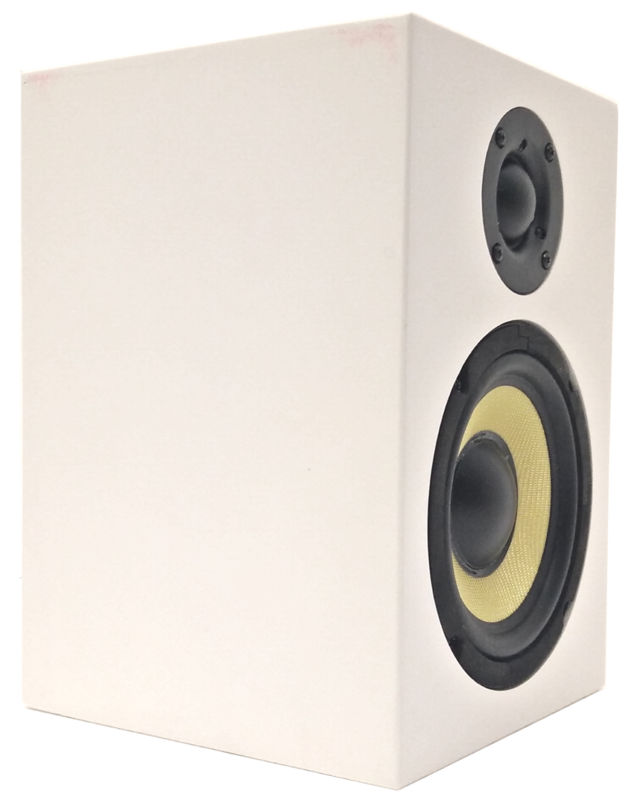 All Little/One loudspeakers are 24cm tall, 17cm wide and 17cm deep, but that's pretty much where standards end. Next to the stock colours black, white and red any other color is available upon request. To match more classical styled interiors natural wood finisched versions are available. To cater for individual taste the Little/One comes with two different driver sets very much like when choosing a car by suspension. Some like it smooth and may choose our polypropylene set where others may prefer a little more analytical ride using the kevlar set. Whaichever set you might choose, the motional feedback electronics will make it sound at least 4 times bigger then the eye would expect. Based on research performed in the Philips Physics Laboratory the first motional feedback enclosure introduced was the 22RH532. Out of respect to the former Philips mfb development team the Little/One is also available as a tribute version closely mimicking the 532's original look and feel. The Little/One enclosure, electronic amplifier module and motional feedback accelerometer are designed, developed and manufactured by hand at Piratelogic in Amsterdam, Holland. We hope that the music passing through these loudspeakers will somehow help to bring just a little more peace to this troubled world. The Little/One electronic amplifier module is located at the back of the enclosure and placed in a die-cast aluminium housing. The amplifier inputs accept normal line level and mobile phone signals by adjusting the volume potentiometer at the top. To allow for easy daisychaining each little/one is equipped with 2 paralel connected in/outputs. To operate at full power a Little/One needs 24VDC at 4A. The animation (large) shows the several stages of correction (1) directly connected to a amplifier without any correction or filtering (2) with 70hz HPF (3) with 20hz step filter (4) with MFB correction (5) with DLP added and finally (6) nearfield 10cm on axis with the tweeter. Tests with other drivers and further tuning are in progress. Please note these measurements were taken in a non anechoic room (my workspace) and thus contain unwanted highnote reflections. Upon request our Little/One's can be fitted with a Dante Interface, an uncompressed, multi-channel digital media networking technology, with near-zero latency and synchronization. 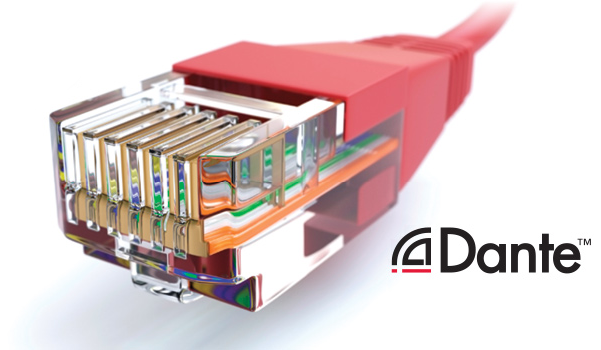 Dante is the preferred audio networking solution that has been adopted by more pro-audio AV manufacturers than any other networking technology. Interoperability is not a dream of the future, but a reality today. Hundreds of Dante-enabled products are available from the world’s leading manufacturers, enabling you to mix devices from multiple manufacturers. 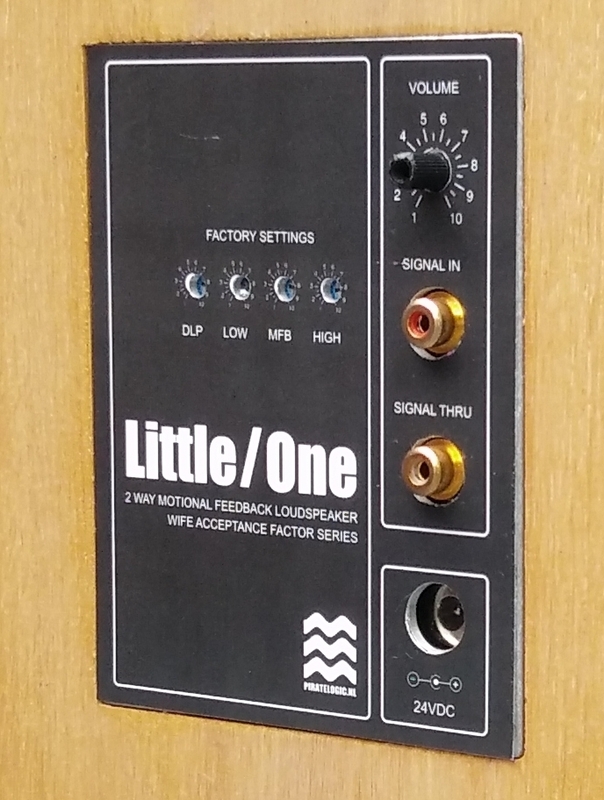 The Little/One is sold through a certified dealer network, to obtain a local dealer address please use our contactpage.